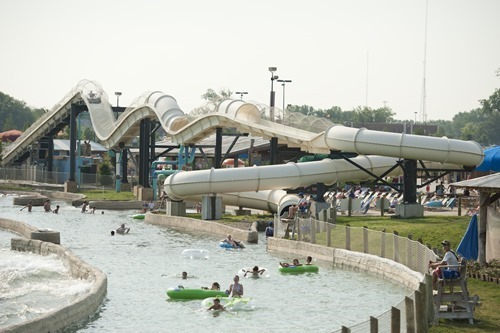 Today I am going to tell you about some of the various attractions at Schlitterbahn Kansas City. Next week I’ll share our experience at Schlitterbahn, so don’t forget to come back! 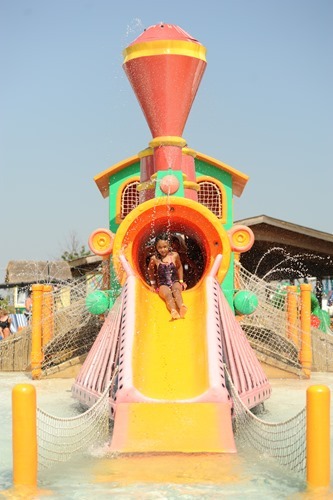 Schlitterbahn is designed to have something for every age. There are attractions that are great for adults and teens, plus there is plenty for the younger kids as well. The Black Knight – a dark tube slide through a fully-enclosed coiled slide. Single or Double tubes allowed. Boogie Bahn – the first and only surf ride in the Kansas City region. A rapidly moving sheet of water rushes across a wave-shaped surface as surfers maneuver control on the surface of the wave that is created. Thousands of gallons of water flow across the padded surface with a water depth is just a couple of inches. Beneath the sheet of water is a foam covered surface to ease the occasional “wipe-out.” Perfect for all surfers, amateur to professional. The Cyclone – a face first mat slide with tight turns and tunnels. Soaring Eagle Zipline – a new ride that takes thrills to new heights. One or two thrill seekers in a 2-seat chair lift are pulled swiftly backward to the ride’s peak 100 feet above Schlitterbahn’s rivers and slides. Riders enjoy a breathtaking view of the park from the top of the Schlitterbahn Kansas City’s tallest ride. Next, the ride changes direction and zooms forward at 30 miles per hour all the way down to the ground to complete the flight. Extra charge required. 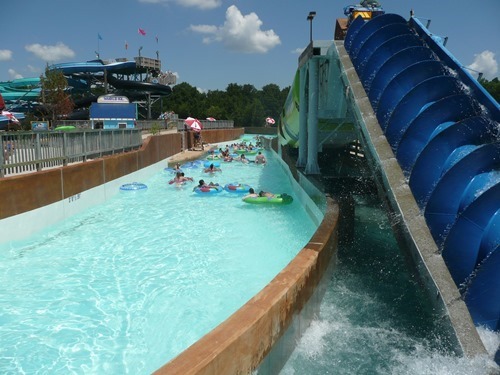 Storm Blaster – an uphill Master Blaster™ water coaster, a signature Schlitterbahn attraction. Storm Blaster combines the up and down thrills of a roller coaster with the unique experience of being propelled upward by jets of water. 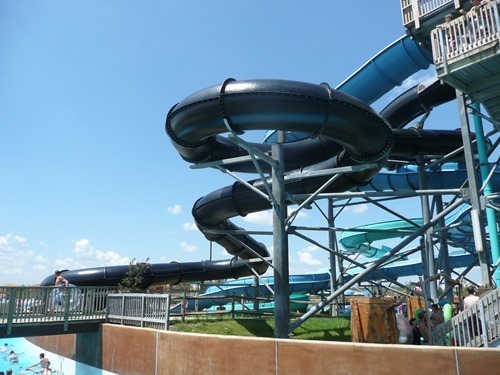 Riders ascend to the top of the three-story launch tower on a ride-up Aqua Veyer to be sent down the first plunge, then back up through a series of peaks and dips before entering the twisting tunnel that leads to the final splash. It’s like a roller coaster but better and wetter! Single or Double Tubes. Twister – a face first mat ride on the fastest ride this side of the speedway. This open-air slide provides a thrilling ride through turns and short tunnels all the way to the finish line! Whirlwind – Riders enter an enclosed black tunnel on a tube slide that curves through turn after turn in the dark. Single or Double Tubes. Bahnzai Pipeline – an open-air tube ride down a twisted path of water wrath…BAHN-style. Single tubes only. King Kaw Rapids River – the park’s longest river ride. Named after the nearby Kansas (Kaw) River, this 3,000-foot attraction includes multiple changes in elevation throughout its exciting downhill trip. Guests float in tubes on a seemingly-endless waterway through a series of waterfalls and lakes before heading into a long series of whitewater rapids and currents. The Torrent River – combines a continuous, endless float with ocean-sized waves for a unique experience. This signature attraction is the world’s longest tidal wave river. Guests grab tubes and enter through Torrent Beach to float through a serpentine canyon with 10 foot walls and waves. Every 19 seconds a 20,000-gallon wave surges through the entire length of this 1,800 foot waterway. Once guests complete the gigantic course, they can continue circling the river for as long as they like. Wolfpack – Take a tube and surge through an extra-wide pipeline of wild water. This oversized slide provides an experience that is different every time you ride! Single or Double Tubes. Boogie Bay – wading level beach waters plus peaceful lounging area. Henry’s Hideout– a soothing getaway that is located right in the middle of all the Schlitterbahn fun. A heated pool with a swim-up refreshment bar. There is a giant fountain as well as the Pirate Ship – an attraction especially for children. Kids climb rope nets, get squirted by canons and slither down four mini-slides right inside Henry’s Hideout. Kinderhaven – designed especially for families with smaller children, this shallow water playground is separated from the rest of the “big kid” activities and is conveniently located in the center of the park. Surrounded by shaded seating and open sun-lounging areas, Kinderhaven lets both kids and parents have fun. Kids will love to explore the Wyandotte Express choo choo train, a friendly frog, a shipwreck and a giant turtle. A giant fountain provides sprinkles for all. There are a total of nine mini-slides for kids in Kinderhaven. Kristal Beach – Giant umbrellas provide shade and the waters of the Kristal River wash lightly on the shore of this calm beach to provide refreshment as riders on the Storm Blaster uphill water coaster fly by overhead. Kristal River – a slow-flowing river for tubes that provides a relaxing float on those hot summer days in Kansas. You can stay in the river for as long as you like! There are double tubes available where the front seat does not open, so kids can sit without fear of falling through! Torrent Beach – A wave pool. Torrent Beach is also the gateway to Torrent River. Whether you want to catch rays, cool off in the surf or embark on journey through the serpentine Torrent River, Torrent Beach is the perfect spot to enjoy a great day. Interested yet? I have an exclusive $5 off regular admission or a discount on a 2 day admission for you. Tickets must be purchased online only through this link using the promo code BLOGGERFUN13. This is valid at the Kansas City Schlitterbahn Park. For the Texas parks try this link! Also don’t forget to leave a comment (on the linked post) to enter my Schlitterbahn ticket giveaway! This post is part of a series sponsored by Schiltterbahn water parks. I received a family four pack of tickets to Schlitterbahn in exchange for writing this series. However, all thoughts and opinions are my own.